Loki's helmet always looked a little cumbersome to me. Awesome but impractical. 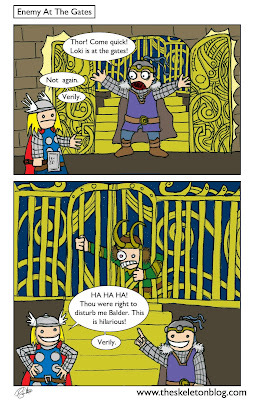 In the comics Thor spoke with like a Shakespearean thing going on, 'Thou hast been slain!' etc. 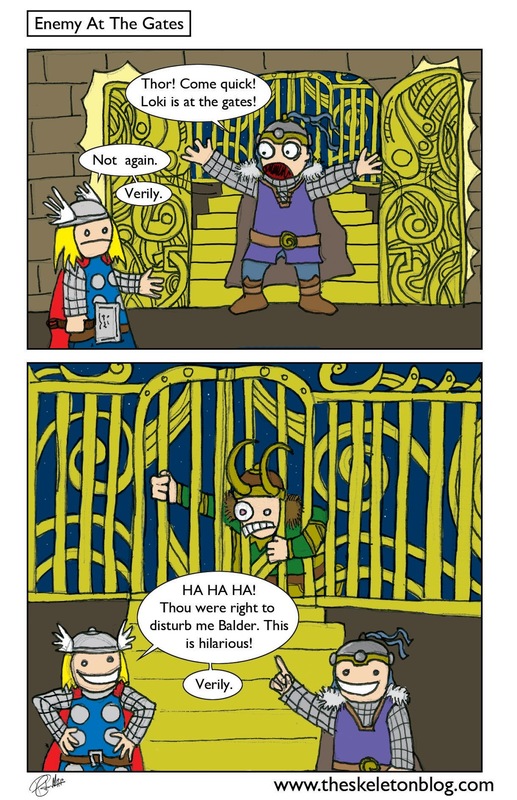 This is a bit weird considering he's a Norse God. Also in the comics I guess they didn't know what to do with him so they gave him an alter ego 'Donald Blake' which is bizarre. Donald is a mild mannered doctor who hits a stick off things to become the 'Thunder God Thor'! When the film came out all the white supremacists were up in arms because the Norse God 'Heimdall' was played by one of those dark skinned fellows 'Idris Elba'. Seems that the KKK are comic fans, I suppose that explains their love of costumes and secret identities. Anyway they boycotted the movie or something because they changed a fictional character's skin colour.